This roasted beet and sweet potato kale salad screams healthy! The basic ingredients for this salad are just four: chioggia beets with their candy cane stripes, sweet potato, kale and Germany’s own version of freekeh — a grain called Grünkern. This is a nutrient dense autumn salad that is deceptively simple to prepare. The vegetables roast themselves while the grain cooks and the only effort you need to put in is a little massage for the kale. I massage all varieties of kale when eaten raw, especially curly kale, since it is particularly coarse by nature. Massaging kale is a great way to soften it up without having to cook it. I’ve bought the season’s first harvest of curly kale, but if you wait until high-season (officially November to March), you’ll find this is the best time to buy it, since cold temperatures enhance its flavor, making this bitter green sweeter. Giving kale a rub down is pretty easy to do. First remove the stems and tear the kale into bit-sized pieces. 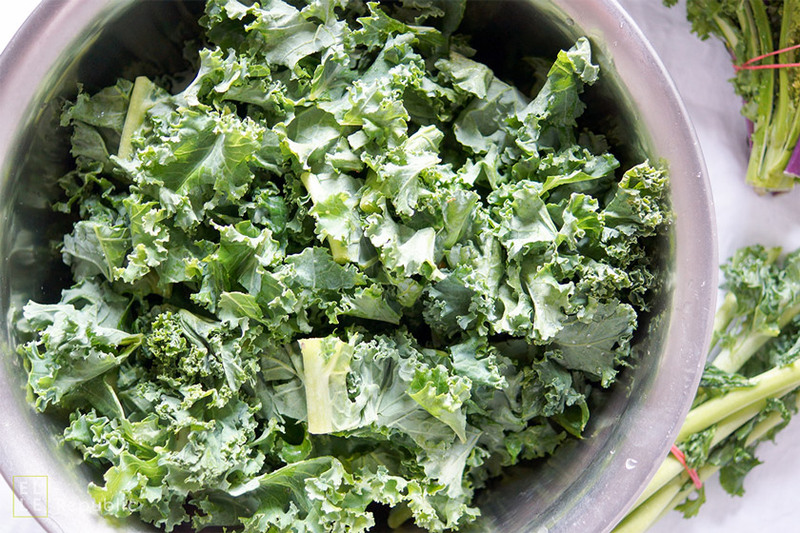 Rinse the kale and then give it a whirl in a salad spinner to remove any excess water. Place in a large bowl to get it ready for a massage. My usual method is to simply add some olive oil, a little sea salt, and a squeeze of lemon; a dressing such as vinaigrette is also fine. With your hands, rub the oil mixture into the kale until all the leaves are fully coated, even the curly edges. Let stand at room temperature (anywhere from 15-30 minutes) to allow the leaves have enough time to soften. Magically, before your eyes, the kale with soften and brighten in color! TIP: Reduce kitchen waste by saving kale stems. Kales stems are a nutritious addition to your morning smoothie. They are rich in vitamins A, C and K, as well as calcium and iron! For this roasted beet and sweet potato kale salad I choose to experiment with apple cider vinegar for massaging the kale. Mostly because I am trying to incorporate more of this super amazing health food into my diet; one little tablespoon at a time. Believed to aid or even fix many ailments it’s worth adding to salads for both its flavor and powerful effects. Organic apple cider vinegar is antibacterial, antiviral and antifungal and so much more. Plus, it’s natural and inexpensive. If you can, buy a cloudy version of enzyme-rich apple cider vinegar (raw, organic and unpasteurized) as it has even more gut-friendly (good) bacteria that helps aid digestion. Grünkern is one of my favourite grains to use in salads or pilafs (and newly chili — coming soon!). It has a wonderful nutty sweetness and smoked flavor and is said to be comparable to the middle eastern grain freekeh (or frikeh), which is also a smoked young green grain, but rather than produced from spelt like Grünkern, Freekeh is made from durum wheat. I would say you could use any grain of choice for this salad; whether your go-to grain is freekeh, farro, barley or spelt or a pseudo grain like quinoa. If you try this recipe, be sure to leave a comment and let me know! Especially if you have tips for other readers. I love to hear your take on my recipes and better yet, take a picture and tag it #ellerepublic on Instagram! I seriously love seeing what you cook up! Perfect for autumn, this roasted beet and sweet potato kale salad is as colorful as it is nutritious! With all its good-for-you nutrient dense ingredients it’s clean eating at its best. Full of savory, sweet, and tangy flavors this makes for a delicious and hearty weeknight salad. Plus it’s highly portable and will fuel you up. 1. Preheat oven to 375°F / 190°C. Line a baking sheet with parchment paper. 2. 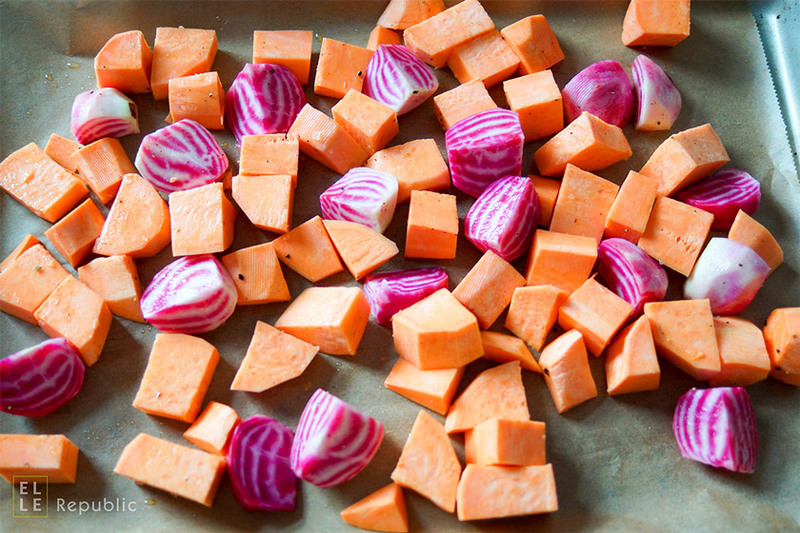 In a medium bowl, toss the sweet potatoes and beets with 1 1/2 tablespoons olive oil and season with salt and pepper. Spread in a single layer on the baking sheet. Roast until tender, stirring halfway through, for about 35-40 minutes (depending on size). They should be just tender, not mushy. Remove from the oven and set aside. 3. While the vegetables are roasting, cook the grünkern with 2 cups (500 ml) water, according to package instructions; for about 30 minutes. Drain if necessary and set aside. 4. Meanwhile, in a large bowl, gently massage the kale with olive oil and salt for a few minutes with your fingers. Add the vinegar and massage for a couple more minutes; until kale wilts and lose some volume. Let stand at room temperature for 25-30 minutes. 5. In a small bowl, whisk together the olive oil, zest and lemon juice, soy sauce, honey, and shallots. Season with freshly ground pepper. 6. In a large serving bowl, combine the roasted vegetables, grünkern and kale. Add the dressing and toss to combine. Season with additional salt and pepper, if desired. Serve and enjoy!